A donation to the memorial statue has been made in honour of this soldier by Miles Hutchins (SC. 1961-65) TO COMMEMORATE and HONOUR the amazing bravery OF THIS SOLDIER and his colleagues who were one of the first cohorts to go into action in 1914. R.M.C. Sandhurst, Kings Indian Cadet, Commission, unattached for Indian Army 1906, 1st Battalion Royal Irish Regiment 1906, 55th Rifles (2nd Lieut '07, Lieut. '08) Operations against Mohmands NW India '08 (Medal & Clasp). Lt.-Col. Sir Philip GAISFORD, Kt., C.I.E. 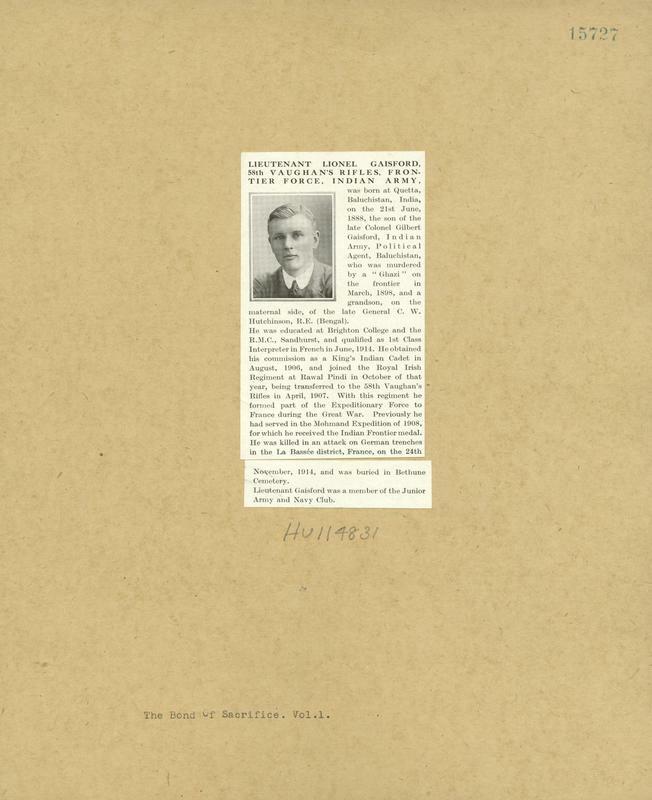 Lionel Gaisford was born in Quetta, India on 21st June 1888, son of Col. Gilbert Gaisford of the Indian Army who was murdered by “Ghazi” on the frontier in March 1898. His mother was Laura Felicite Lewis Gaisford (nee Hutchinson) and her father was General C. W Hutchinson, R. E (Bengal). His siblings were Guy Gaisford, Lt. Col. Sir Philip Gaisford, Kt., C.I.E and Doris Felicity Gaisford. In the 1901 Census he is a pupil, aged 12, at Mostyn House School, on the Wirral, born in Clifton, Lancashire. He was then educated at Brighton College and at Sandhurst and qualified as 1st Class Interpreter in French in June 1914. He obtained his commission as a King’s Indian Cadet in August 1906 and joined the Royal Irish Regiment at Rawal Pindi in October 1906, being transferred to the 58th Vaughan’s Rifles in April 1907. With this regiment he formed part of the Expeditionary Force and served in the Mohmand Expedition of 1908 for which he received the Indian Frontier Medal. He went to France during the Great War. His Regiment was part of 21st Indian Infantry Brigade, 7th (Meerut) Division and, given the Gaisford connection with the Seaforth Highlanders, it is interesting to note that the 1st and 1st/4th battalions of the Seaforth Highlanders were both serving in the Division at the same time. He was killed in an attack on German trenches on 23 November 1914, during the Defence of Festubert. Hewas 26 when died. He is buried in Bethune Town Cemetery, near Arras, France.